Should Your Skincare Products Sting? Does It Mean They Are Working? In the quest for skin perfection with the use of potent active ingredients to achieve it, you might notice that your skincare products sting when applied. It might not last very long, but a stinging sensation is happening. Is this a good thing? Does it mean the products are working and doing their job effectively? In this post, I’ll answer all of this and more. What is a sting from skincare products? A sting is an inflammatory reaction to something that has been applied topically. The skin on the face has nerve fibers that are close to the skin’s surface. 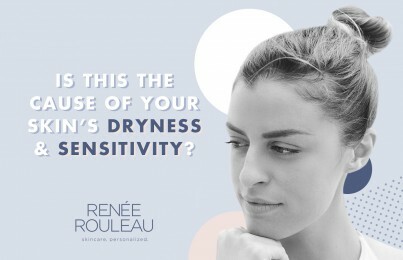 When a skincare product is applied to the face that is either not agreeable with your skin or one that has a lower pH, you’ll get varying degrees of sensation. Since blood vessels are also close to the skin, it can also give off redness. When you feel a slight sensation happening, but it is mild and dissipates quickly. (Usually within five seconds.) You can feel something happening, but it resolves on its own without seeing any visible redness. A mild prickling sensation that gives an indication that something is happening. A stingle will go away on its own but can take up to 10 seconds or so. The skin may or may not get slightly pink and flushed. A moderate to severe prickling sensation that continues on. When skincare products sting, you’ll feel it a lot. There are various degrees of stinging, with the mildest going a bit beyond 10 seconds and the strongest continuing on for up to one minute or more. (If over a minute, you’ll likely enter into the burning-feeling phase.) Sometimes a sting can go away on its own but other times it won’t go away until whatever caused it is rinsed or washed off. Depending on the severity of the sting, the skin can get flushed with a reddened look to the face. A skincare product that has a lower pH than your skin’s natural pH. You’ll mainly find these with exfoliating acid-based products. Skincare products that are highly fragranced with synthetic perfume or natural essential oils, such as citrus and mint oils. 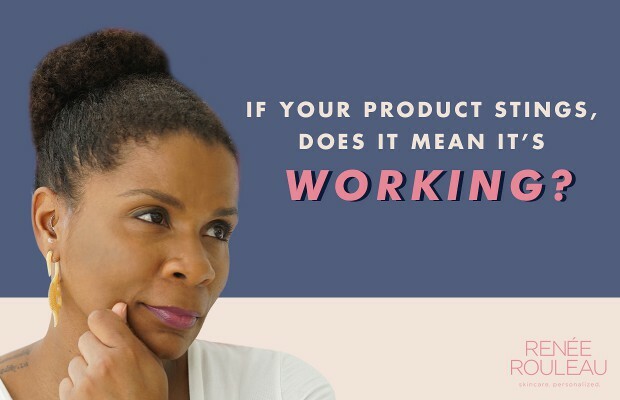 Your skin isn’t agreeing with something in a product, and it may be hard to know exactly which ingredient(s) is the cause. A product contains solvent alcohols like SD Alcohol 40 or Denatured Alcohol. Your skin is naturally sensitive with a delicate skin barrier and is easily reactive to a lot of things that are applied. This is very common in skin types #4, #5 and #9. Your skin is severely dry (lack of oil) and your skin’s barrier is compromised. This is can be from a dry climate, airplane travel or use of topical prescription retinoids. You’re taking an oral medication where stinging of the skin is listed as a side effect. When is it okay or considered normal for skincare products to sting? When you use any acid-based exfoliating product in the form of liquids, gels, and creams. Acids such as glycolic, lactic, malic and salicylic will lower the pH of the skin putting it in an acidic state which creates a tingle, stingle or a sting. What if my acid serum used to sting and now it doesn’t anymore? Is it no longer working? Many people will notice a stingle or a sting when they first start using acids. This is completely expected and considered normal. After a while, this side effect can go away. The reason for this is because exfoliating acids actually improve lipid production to repair your skin’s barrier. When the barrier is intact (with the help of gentle acids), you’ll experience less of a sting. The problem occurs when people associate the stinging with “working.” It’s the “no pain, no gain” mentality that people fall into. If you keep trying to chase the sting by moving up to higher percentage acids, you’re causing damage to your skin by keeping it in a state of inflammation. The goal is for you not to experience much of any tingle, stingle or a sting with your everyday skincare routine. If you’re new to acids, Ultra Gentle Smoothing Serum is a mild one to start with. When is it not normal for skincare products to sting? When any product stings and leads to dry, patchy skin or a condition known as contact dermatitis. Note: Eye creams can sometimes cause the eyes to sting and water. This isn’t usually because of the cream itself but due to it being applied too close causing it to seep into the eyes. 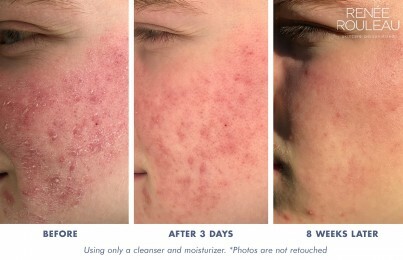 Bottom line: Healthy skin is hydrated skin. 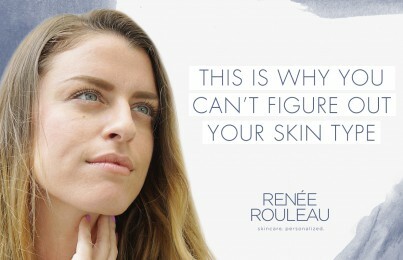 You want to continually work to strengthen your skin’s moisture barrier to seal the cracks so that moisture stays in the skin and your nerve endings aren’t so reactive. Read how to fix a damaged moisture barrier.